In the 3D printing wave, many forms arise to get new designs which allow easy fabrication. Typically, 3D printers use filaments to produce patterns in surfaces by applying the polymers in a hot surface with an XYZ Cartesian control. Meanwhile, the thread is melted and extruded to provide enough layers. However, biological applications require materials which are different from the thermoplastic filaments like PLA (polylactic acid) or ABS (Acrylonitrile butadiene styrene). Take for example food printers these devices are loaded with syringes which contain viscous fluids like pasta or biopolymers which are extruded and follow the patters for new intricate designs. *3D Electrospinning for energetic electrode materials. The materials for this enterprise have also been discussed by authors working with Do-It-Yourself devices. However, the idea is to use the high control of commercial syringe pumps to direct the flow with high precision. The production 3D (3-dimensional) porous silver nonwoven mats were demonstrated using a spray nozzle which is located about 6 cm above the sample stage to minimize the effects of air circulation in the fume hood. Scientists designed the homemade spray-coating equipment with a motorized 2-axis moving scene using heating element for coating the homogeneous electrode. The solution was pumped through a nozzle with a Chemyx syringe pump at 250 ml/min. For instance, an aerosol is formed using nitrogen (1 bar) as a carrier inert gas, and a regulator maintained a stable pressure (Jang et al., 2015)⁠. Figure 1. 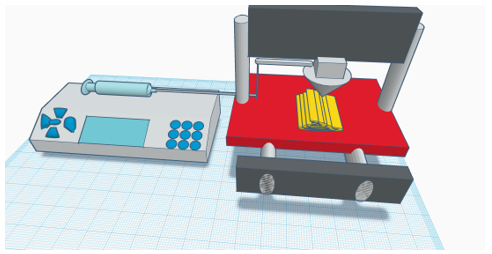 A Chemyx syringe pump conjugated with a Cartesian system as a 3D printing device for the elaboration of porous silver nonwoven mats as an example. The system can is adapt for other printing procedure as cells or biopolymers. Bioprinting has been taken a step further and 3D printing applications as developed by Feinberg group are taking the lead; opening the exciting possibilities that these devices provide to the healthcare field. They made a syringe integrated system to avoid the time delay they use a NEMA 17 which we already discussed in Chemyx website. The system itself enable the printing of complex shapes or objects (Pusch et al., 2018)⁠. Also, they used with the process of printing 3D hydrogels which are useful in health care studies. Meyer’s group has also developed a technology that combines bacterial films to form new materials with the reproducibility. A commercial 3D printer was modified for these new bacterial systems with alginate-based bio-ink chemistry. Syringe pumps may also be integrated to produce this type of extrusion(Lehner et al., 2017)⁠. Different syringe pumps can be allocated for 3D printing devices, the applications are vast, and the Chemyx syringe pumps provide the accuracy for the best performance delivering viscous materials. Syringe pumps with cartesian devices easily achieve techniques as electrospinning; therefore, custom applications are developed for tissue engineering and catalytic material optimization. If you want to know more about Do-it-Yourself syringe pumps and the differences with high-performance syringe pumps offer by Chemyx, please visit the Chemyx website to learn more. Derek, B., Grace, D., Dow, T., Sellman, Z., 2016. 3D Electrospun Tissue Scaffold: Achieving Customized Fiber Alignment. Worcester Polytechnique Institute.